If you’re a fan of pawpaws, you’ve probably eaten your share of the fresh fruit in season. But what about the rest of the year? Pawpaws are notoriously hard to store for more than two or three weeks in the fridge, and if unrefrigerated, the large, oval fruits ripen quickly and must be eaten within a few days. 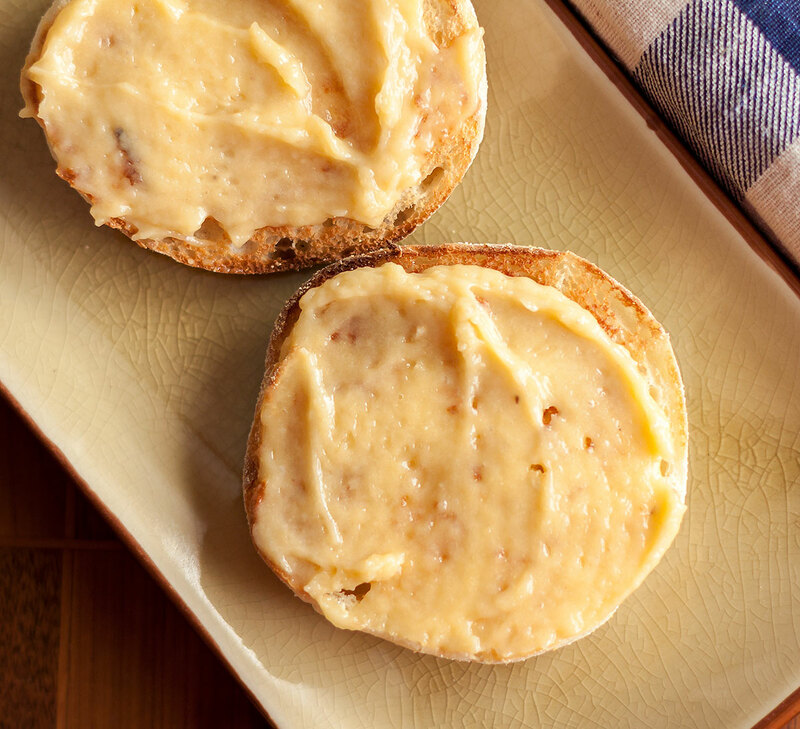 Pawpaw curd, another fantastic way to preserve the exotic flavor of pawpaws – practically indefinitely. Fruit curds are a mixture of fruit juice or puree, eggs, sugar and butter – lots and lots of rich, silky butter. Traditionally served at afternoon tea with bread, cakes and pastries, fruit curds make a refreshing alternative to jam or custard. While lemon curd is undoubtedly the most popular and best known, fruit curds can be made from practically any intensely flavored fruit or berry, including pawpaws. Pawpaw curd takes a little time and attention to make, but that mostly involves stirring, stirring, stirring. But once the work is over and the curd is done, the real fun begins. It’s super easy to create spectacular, fresh-tasting desserts with homemade pawpaw curd. 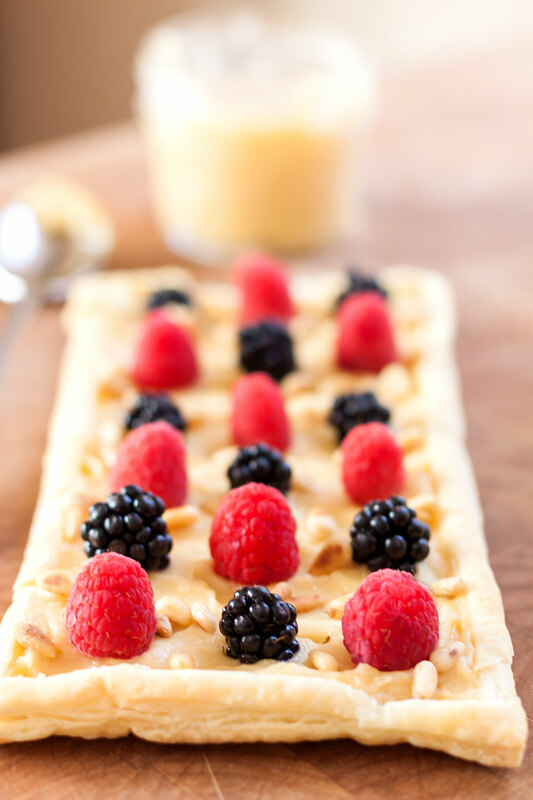 One of our favorite ways to use it is spread on crisp-baked rectangles of puff pastry, topped with a combination of fresh fruit, nuts and berries. We’ve found that the sweetness of the pawpaws benefits from a little tartness to give it balance. 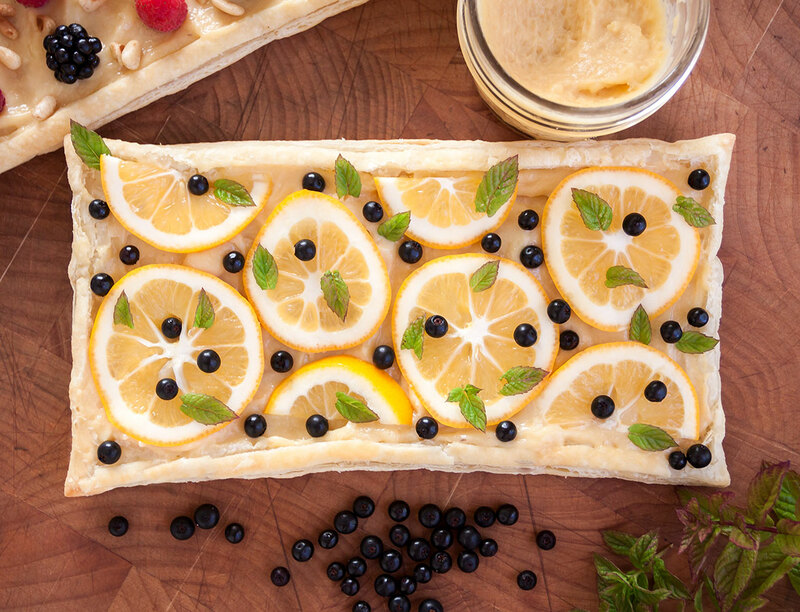 Pictured are two variations on this theme: puff pastry topped with pawpaw curd, thin slices of Meyer lemon, fresh huckleberries and mint leaves (top photo). Meyer lemons, a cross between lemons and mandarins, are naturally sweeter than other lemons and have a thin rind that is aromatic tasty and tender enough to eat whole. Even easier is the version simply topped with fresh berries and toasted pine nuts. With a little imagination, the possible variations are endless. 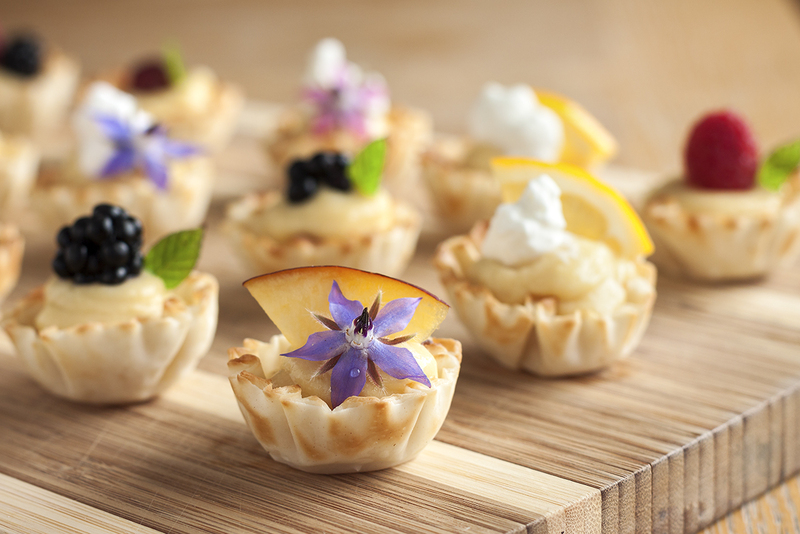 Make a pawpaw meringue tart, fill phyllo cups with pawpaw curd and top with fresh fruit or spread pawpaw curd on toast, scones and (our favorite) crisp-toasted English muffins. Tightly sealed in a jar, pawpaw curd keeps for weeks in the refrigerator, but for even longer storage, freeze it. Pawpaw curd freezes exceptionally well (must be all that butter! ), allowing you to enjoy pawpaws the entire year round. We don’t always bother straining our pawpaw puree before using it, but in this case, we wanted the creamiest possible texture for our pawpaw curd. It only takes a couple of minutes to press through a strainer, but it makes a world of difference. Fresh pawpaws are in season only during the months of September and October and can be shipped throughout the continental US. Order them now at earthy.com. Combine the eggs, pawpaw puree, lemon juice, and sugar in a non-reactive mixing bowl or in the top half of a double boiler. Whisk together to combine ingredients. Set the bowl over a pot of gently simmering water, stirring constantly with a whisk. Stir and scrape along the sides and bottom of the bowl as you go. It’s important to keep everything moving, especially around the edges, to avoid the dreaded “scrambled” curd. Continue to cook & stir until the mixture begins to thicken noticeably, about 8 – 10 minutes. Don’t worry – you’ll be able to tell. Remove the bowl from the heat and set it on a doubled kitchen towel on a work surface. Begin whisking in the butter, a piece or two at a time, stirring until each piece is completely incorporated before adding more. Continue adding butter and stirring until all the butter has been used and the consistency is smooth and glossy. Spoon the mixture into a medium bowl. Gently press a sheet of plastic wrap directly onto the surface of the curd and allow to cool. Slip the cool curd into the refrigerator to chill for at least an hour before using. The pawpaw curd will continue to thicken up as it cools. Pawpaw curd will keep for several weeks in the refrigerator or for many months in the freezer.